Reader's question: "What's the round sticker on my car windscreen with a date on it? Shaken?" Nope. Shaken is the square one in the middle. The round one is the 12ヶ月点検整備 (12 kagetsu tenkenseibi) - annual check and repair (shaken is every 2 years, or 3 from new). Read on for what to do about it. 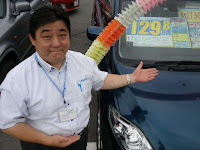 A garage will gladly handle the checkup for you, for a cost of around 10,000yen. It is also possible to do the check yourself for free. If you choose to do so (as 40% of Japanese people do), you will not have a new sticker, but the car will be legally roadworthy. In other words, you don't have to prove that your car has been examined. Some people may take this an excuse not to do the check at all. Use a simple line such as "tenken seibi kudasai" if you go to a garage/shop. Power steering apparatus • Is the belt loose, damaged? drive shaft • Is it loose? Use a maintenance site such as CarBibles to find guides to doing these checks.